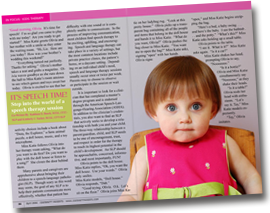 Child Therapy Atlanta | Georgia Language and Occupational Therapy | TSG, Inc.
My child is two years old and is not talking. Is this normal? While development can vary from child to child, typically children 18 months old have between 10 and 20 spoken words, children 2 years of age have approximately 50 words, children 2 ½ have approximately 250 words, and children age 3 have approximately 450 words. If your child is not using the expected number of words, it is a good idea to consult with your pediatrician and schedule a speech-language evaluation with a certified speech-language pathologist to determine if speech therapy is needed. Insurance coverage for therapy varies from plan to plan. Some plans pay for therapy regardless of the diagnosis. Some plans only cover therapy if the disorder is a result of a medical condition. Therapy Solutions of Georgia, Inc. will be happy to assist you in determining your specific benefits before therapy is initiated. My child is having difficulty chewing and eating foods with chunks. Is this something that speech pathologists address? Yes. At Therapy Solutions of Georgia, Inc. we work with children with both swallowing disorders and sensory concerns. We help children learn to accept, chew, and swallow foods with a variety of textures. We also help children who are coughing frequently when drinking liquids. Therapy often involves participation in an oral motor program to strengthen the muscles of the mouth. 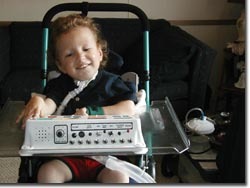 How do I know if my child would benefit from OT services? If your child has difficulty catching or throwing a ball, appears to lack coordination when compared to other children his/her age, has difficulty keeping up with written work in the classroom, has a hard time learning letters, numbers, or shapes, reverses letters when writing, has difficulty manipulating small objects, has difficulty following directions with multiple steps, gets easily distracted by visual stimuli, dislikes being touched, has difficulty tolerating nail cutting, hair brushing, or tooth brushing, frequently bumps into objects, dislikes being off of the ground, and/or displays sensitivities to sounds, smells, or textures he/she may require the intervention of an certified Occupational Therapist. What type of training is required for a speech-language pathologist to be certified? To be certified by the American Speech-Language-Hearing Association, a therapist must hold a master's degree in Speech-Language Pathology from an accredited university. During the master's program, students are required to have at least 375 hours working directly with patients. In addition, upon graduation, therapists are required to complete a clinical fellowship year which involves working as a speech-language pathologist with both direct and indirect supervision for 9 months. After completion of the clinical fellowship year, speech-language pathologists apply for their Certificate of Clinical Competence from the American Speech-Language-Hearing Association. In the state of Georgia, a license is also required to work in a hospital or private practice. What type of training is required for an occupational therapist to be certified? To be certified by the National Board for Certification in Occupational Therapy, a therapist must hold a master's degree in Occupational Therapy from an accredited university. During the master's program, student are required to complete two full time 12 week internships in which they provide direct patient care under the supervision of a board certified therapist. Upon successful completion of academic and patient care requirements, occupational therapists must pass a national certification exam. In Georgia, a state license is also required to work in a hospital or private practice. If I want to have my child evaluated what should I do? To schedule an evaluation you can call our office at 678-377-9634. We will set up a time for you to come in with your child. A prescription from your child's pediatrician will be required. We will also need a copy of your child's insurance card upon arrival. An evaluation generally takes between an hour and two hours. The type of test administered depends on the areas of concern. If concerns involve speech and language then your child will be given a complete language evaluation looking at both expressive language (what your child is saying) and receptive language (what your child is understanding). He/she will be asked to perform tasks including pointing to pictures in a book, following directions, and using words for a variety of purposes. If sound errors are a concern, then your child will be given an articulation test to look at sound development. When we are working with younger children, the testing frequently involves play with toys. With swallowing concerns, we will watch your child eat foods of varying tastes and textures as well as drink liquids to determine if he/she is presenting with a swallowing or sensory disorder. Occupational therapy evaluations generally involve assessment in many areas including grasp, visual motor skills, handwriting, fine motor skills, self-care, dexterity, coordination and balance and/or sensory processing. We give parents the option of joining the evaluation or remaining in the waiting room. If you would like to accompany your child during the evaluation, we ask that you leave siblings at home. You will be asked to complete a case history form including medical information and the developmental milestone history of your child. When observing the evaluation it is important not to "help your child" by giving out clues or rephrasing questions so that an accurate assessment of your child's developmental level can be determined. If my child qualifies for therapy, how long will he/she require therapy? There are numerous factors which may impact the success of therapy with any given child. 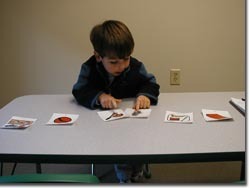 Some of these factors include cognitive level, attention skills, play skills/social skills, behavior, desire to learn and/or please others, carryover of therapy techniques/suggestions in the home environment, origin of the delay or disorder, rapport/relationship established with the therapist, and consistency of therapy sessions. Some children may only need therapy for a few months while others may require therapy for several years. Occupational Therapy (OT) is available for children, adults, and the elderly in a variety of settings. 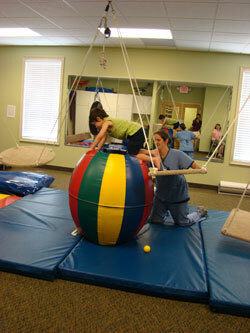 Pediatric OT helps children develop the skills required to perform their activities of daily living. These activities may include bathing, dressing, eating, playing, and learning. Through creative therapeutic sessions children work to improve deficits in areas such as fine motor, gross motor, visual perception, visual motor, and sensory processing so that they can work, play, and learn to their full potential. If you are interested in child therapy near Atlanta, contact us today. With years of experience in speech and occupational therapy, we are able to develop a treatment plan tailored to your child's needs. If you have any questions or concerns, please feel free to contact us!